Just like it’s hard to describe why your favorite song is just that, I find it difficult to put why I chose Alpha Chi Omega into words. When I was going through recruitment, I had it in my mind that I would join a sorority with cookie-cutter girls exactly like me. While it is important to have similarities with your sorority, I have not found this to be true at AXO and I could not be more thankful for that. In keeping with the musical heritage of Alpha Chi, I can liken Beta Sigma to a symphony. Each girl is her own instrument, unique from the others in sound and tone, but she is only made better by the accompaniment of the other instruments. Each one of us has her own talents and can certainly be successful individually - and there is a time and place for solo performances. But the real magic occurs in the harmonies, with each girl’s skills being accentuated by the others’. That is what I have found in this chapter: a place where I can flourish individually, but simultaneously celebrate and be apart of the accomplishments of my ever-talented sisters. And although each girl is running after her own dream, a dream that may look vastly different from that of the girl to her right or her left, we share a crucial thing in common: the desire for the utmost good for one another. Love in its purest form radiates from 1064 S. Lumpkin Street. And it surely doesn’t stop there; every time I walk around campus, the smiling faces of my sisters greet me and brighten my day without fail. Beneath the ritual, the events, and the (really cute) t-shirts lies compassion, respect, loyalty, and most of all, love. When I was homesick my first semester, it was my sisters who both listened to me and helped me get out of my slump. When I have an important exam, it is my sisters who remember and send me encouraging texts. When I need a favor, advice, or prayers, my sisters come running to my aid, genuinely concerned and willing to help in any way they can. This love does not stay within the boundaries of AXO, either. I have been taught both the meaning and the importance of service from this group of women. Before joining Alpha Chi, community service was something I did to add to a resume. This chapter put faces and stories behind our philanthropies and helped me to understand just how significant and necessary our contributions are. The passion that radiates from Beta Sigma is palpable and contagious. This sorority is more than a social club – it is comprised of the most driven, selfless, and authentic women I know, and I am beyond proud to wear the letters of Alpha Chi Omega. So I suppose the answer to the question Why Alpha Chi? is not as complex as I originally thought. The “why” is woven in the fabric of this chapter; patched together by the enthusiasm, benevolence, lightheartedness, and devotion of each member. Whether it be in the good times, the dancing, the singing, the laughing (and not to mention the occasional late-night snacking), or in the not-so-great, I-need-a-shoulder-to-cry-on times, I can count on these girls to be right by my side. The accumulation of these things and the hundreds of things not mentioned are why I chose Alpha Chi. Our song is special, and I am more than delighted to be a piece of this symphony. Camp Kesem is a national nonprofit dedicated to supporting children through and beyond a parent's cancer. The organization is operated through 62 collegiate chapters across the country, that provide a FREE summer camp experience for these children, in addition to year long support. Camp Kesem was brought to UGA by Alpha Chi Omega alumnae Jess Valle and Jenna Barnett in 2011. In their first summer, Camp Kesem served 12 campers. Now, rounding out its fourth summer, Camp Kesem served 100 campers this June. Why is it important to Alpha Chi Omega? 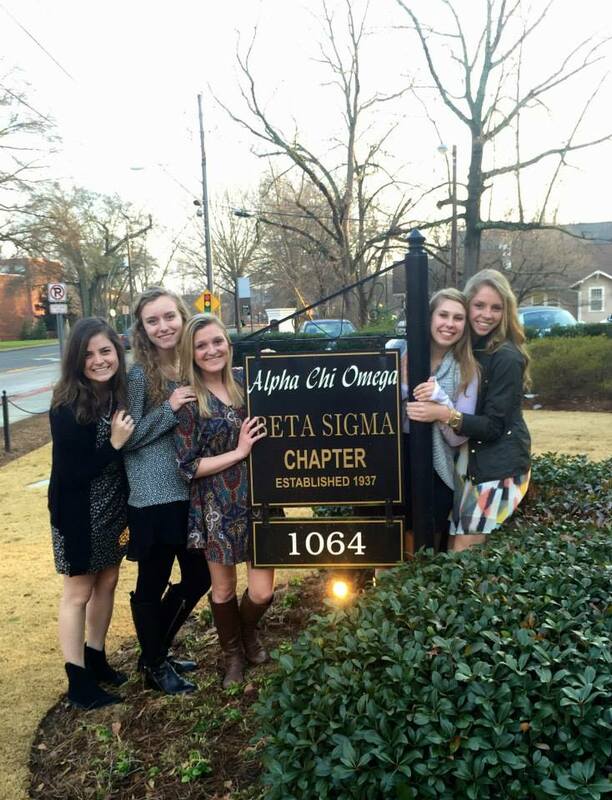 "Alpha Chis have been in leadership roles for Camp Kesem UGA since its beginning. Shelby Staratt and myself served as the Co-Directors in 2014-2015, and because of that, we were able to share the message and mission of CK, and encourage others to get involved. Watching our friends and fellow sisters having fun and making a difference in the lives of our campers is so amazing. These girls are so selfless and generous with their time and energy. They genuinely love the kids and it shows in everything that they do. I'm thankful for them and thankful for Camp Kesem for making a huge difference in my life. What's the best part about being involved in Camp Kesem? : While sitting at lunch one day with a camper, I asked her how excited and happy she was to be at camp. This sweet 9 year old responded by saying, "With Camp Kesem, I have enough happiness to last me a lifetime." Hearing these words was the moment I realized what an impact this organization has on these kids. They are so inspirational, and I feel so lucky to be a part of their lives." Why Alpha Chi? : AXO is full of incredibly genuine, driven, fun, and smart girls. Each girl is unique in her own way and is not only accepted- but is praised and loved for being herself. These girls are lifetime friends who will stick by you and build you up no matter what. I have found my home in AXO. Best part about being involved with Camp Kesem: You get to help the kids forge lifelong support systems. You get to make them smile and smile with them for an entire week. You get to make them smile and smile with them for an entire week. Why Alpha Chi? : I'm an Alpha Chi because these girls are so inspired to make a difference and serve others. How did you get involved with Camp Kesem? 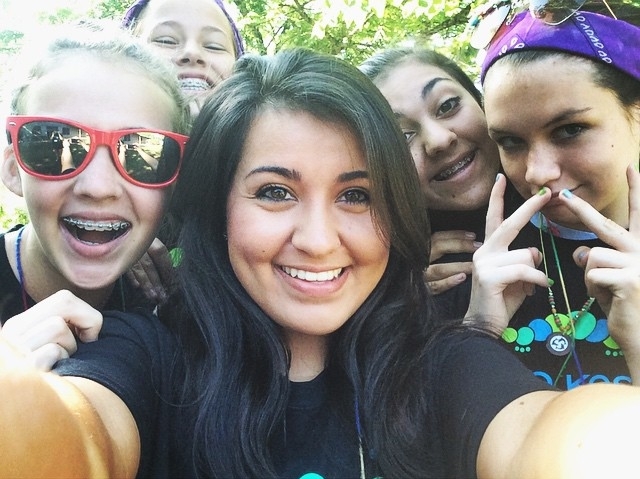 : I heard about Camp Kesem through the lovely AXOs who were on Camp Kesem's executive board. I went to the first meeting and fell in love with their mission! Favorite memory from CK: It's hard to pick a favorite memory from camp because the entire week was absolutely incredible, but I would have to say messy Olympics was one of the best parts. It was amazing completely cutting loose and experiencing pure joy with the kids. It may have taken me four showers to get the orange paint out of my hair, but it was so worth it! Favorite Memory: One of the eleven-year-old campers in my cabin made me a friendship bracelet and told me she would never forget me. Just knowing that I've touched someone's life in just one week was a really rewarding feeling. These kids look up to the counselors and you can tell that camp is their favorite week of the year. Best part about being involved in CK: One thing I love about camp is that I can see where all of my fundraising efforts go. That money helped add to the Camp Kesem family, and I got to witness the love, selflessness, and support of this family firsthand. Why Alpha Chi: I chose Alpha Chi because I felt as though these girls would encourage me to be the best version of myself. After my first year, I could not imagine being anywhere else. How did you get involved in Camp Kesem? : I heard about Camp through some of the AXO's that were involved in the organization! It was a great way to meet new people and get to know more of my sisters! What's your favorite CK memory? : On one of our first nights of camp, our entire cabin had a glow in the dark rave. All of the girls in our unit and the older unit danced for hours. It was one of the best times of my life! Why Alpha Chi? : Alpha Chi has brought me so much closer to women who have the same passions as I do. It was so great to get to lead a group of kids alongside so many sisters. Seeing my friends' genuine and caring hearts through this weeks has truly heightened my love for this sorority. If you've taken a tour of UGA recently, you might recognize these two beauties! Sehar and Shreya are involved with one of the most sought after positions on campus as tour leaders at the UGA Visitors Center. Hot or cold, rain or shine (and in Georgia you know how that goes) our girls thrive in telling the story behind this amazing place that we all know and love! Tell us about your favorite place to eat in Athens. Sehar: Clocked burger joint. It has the most unexpected, yet satisfying burgers I have ever tasted. From peanut butter sauce to a falafel patty, each burger has its own signature flavor! Shreya: Heirloom Cafe. My favorite meal there is brunch because they make their own jam and give you an unlimited amount of chocolate chip scones (insert heart-eyed emoji here). Why did you want to get involved as a tour leader at the UGA Visitors Center? Sehar: I wanted to be a tour leader because although coming to UGA was the scariest thing I’ve ever done, it has also been the most rewarding. I wanted to share my experiences with incoming college freshmen so that they knew that it was okay to be nervous, but that it was also important to step out of their comfort zones. UGA has become my home away from home and I really just wanted to spread that love! Shreya: I chose to apply to work at the Visitors Center because I want to help prospective college students realize that, regardless of the school they ultimately choose, they should be able to see themselves making a campus their home for four years and longer. As we always love to say at the VC, “It is easy to make a big school small, but hard to make a small school any bigger than it already is." I want students to know that there is a place for everyone at the University of Georgia. What has your experience been like so far as a tour leader? Sehar: I have loved every second of it. It honestly doesn’t even feel like a job because I get to talk about everything that I’m passionate about. Shreya: Working as a tour leader has taught me to get comfortable being uncomfortable while interacting with personalities different from my own. It has also challenged me to maintain my poise in unexpected situations like leading a walking tour in freezing rain, filling awkward silences with even more awkward jokes, and assuring flustered parents that their child will not be rejected from UGA because they were late to a campus tour. What advice would you give to someone who is just starting out at UGA? Sehar: Don’t be afraid to break out of your shell and do something new! If you want to eat a peanut butter, chocolate chip waffle with lucky charms and ice cream on top at the dining hall, no one is stopping you! Shreya: Walk everywhere. It's a great way to explore campus and Athens as well as justify taking full advantage of UGA's incredible, unlimited meal plan. What is your favorite memory in being a part of Alpha Chi Omega? Sehar: This past year, I had the opportunity to live in the house and I can honestly say that it was the best decision I have ever made. There were so many times when I walked into my room to find five girls already sitting on my floor welcoming me, or finding random treats on my pillows with awkward notes from a “secret admirer” (Arden, I know it was you). I grew so much just by living next to these girls and it’s all because I made a decision my freshman year to go AXO. Shreya: My favorite memory as member of Alpha Chi Omega is from Big-Little Reveal. Being able to call one of my mentors and closest friends, Alex Lilly, my big helped me feel more connected to the sorority early on in my freshman year. Sehar: I chose Alpha Chi because we are original and we are so diverse. I never imagined myself being best friends with girls who are so different from me. But the truth is that those differences ignited the growth in myself that I would have never found anywhere else. Like I said before, I was so intimidated to come to UGA. Alpha Chi gave me a home to flourish in and the support I needed to get out of my comfort zone. Shreya: AXO’s are plugged in everywhere on campus – as board members of student organizations, academic scholars, community outreach leaders, etc. These “real strong women” are making an impact on the UGA community and on people’s lives. It makes me proud to be an Alpha Chi when I see them pursuing their goals with a fan club of sisters cheering them on. This sister spotlight is dedicated to Daron Blankenship. As Alpha Chi’s we have a passion for philanthropy and giving back to the community, but Daron has gone above and beyond as her passion for autism awareness has made her the Executive Director of AutismUGA. Keep reading to learn more about Daron’s experiences with autism and AutismUGA. Tell us about AutismUGA AutsimUGA is a student run organization that works with schools, families, local support groups, speech pathologists, and other community members to build support, raise awareness, and volunteer with those impacted by autism. We have 2 main fundraising events each year: one in the spring and one in the fall. Our big spring fundraising event is a pong tournament held downtown! This is only the second year we have held this event, but we have had great experiences and feedback from it so far with all of our participants being very competitive. During the fall we typically host a 5k on campus. For Fall 2015, the executive board is planning on changing it around and possibly doing a 1 mile obstacle course - the obstacles being all of the challenges that children with autism have to overcome every day. What made you want to get involved? My little brother has nonverbal autism, and with him only being a year younger than me, my life has been completed formed based on him. In high school I helped start a club with his special needs class to integrate students in the non-special needs classrooms in with students in his classroom with extracurricular activities. I loved this club so much in high school that I wanted to get involved with special needs on campus. Fall semester freshman year I was looking for an organization that I could become a part of, I stumbled upon AutismUGA, and the rest is history! What do you wish more people knew about autism? I think the most important thing I have learned about Autism is that verbal or nonverbal, we need to give people with autism more credit, they are some of the smartest people I have ever met. Just because people with autism do not act the same way as you, it doesn’t make them less smart or capable. The children with autism that I have had the blessing of meeting throughout my life have proved to be the most kind, heart-felt, caring, and incredibly talented individuals I have ever met (and some of them I have never actually been able to speak to). I think it is important for everyone to read books written by people with autism, and to not listen all the time to the way certain types of media portray autism. The best way someone can learn is to go straight to the source. What do you love about AXO? Something that I love about AXO is how caring all of the individuals in this sorority are. Many of my friends come from different backgrounds, and we all have our own stories, but when something happens in our lives we are all there for each other - and it's not just for that day or week when something happens, everyone checks up on you all the time and it is amazing to feel so loved by such a large group. Recently, my nonverbal brother (who is 20 years old) began communicating for the first time. Can you imagine being able to FINALLY have conversations with someone who you have always wondered what has been going on in his mind for 20 years? Of course I was shaken and excited and extremely emotional, but throughout this entire experience girls in AXO were JUST as excited for Reece as I was, and some hadn't even met him before! This happened around October, and even now girls in AXO will come up to me asking about Reece and how he is doing, what new things he has said, and how I am doing...some have even joined AutismUGA! AXO is full of incredible individuals that have impacted me in a multitude of ways and I cannot thank them enough for the support and friendship I have had with them for so many years. Tell us about your favorite place to eat in Athens. Wow this is a hard question! If I had to pick one, my favorite place to eat in Athens is Trapeze. I dream about those sweet potato fries. Favorite show to watch in the informal- The Thursday night binge-watching of Grey’s Anatomy, Scandal, and How To Get Away With Murder, with my little cup of Chex Mix. What is your favorite memory in being a part of Alpha Chi Omega? My favorite memory in being a part of Alpha Chi Omega is the daily laughs I have with all of my sisters. No matter if I am having the best day of my life or the worst, my friends in Alpha Chi Omega never fail to make me laugh until my stomach hurts. They are the most kind-hearted and utterly amazing people I have ever had the pleasure to call my friends. Describe your involvement and experience with ugaMiracle. ugaMiracle, besides Alpha Chi Omega, is the best organization I have the honor of being very involved. This past year within ugaMiracle, I was the Family Relations Wall of Hope Committee Lead. The title aside, I was in charge of designing and organizing a huge display at our main event Dance Marathon that highlights all of our amazing Miracle Children. With the help of my other Committee Lead and my subcommittee, we were able to create an interactive and beautiful wall that attracted not only people in ugaMiracle who wanted to learn more about the children’s stories, but also the children. It made my heart so happy when I saw little children running up the wall and seeing their picture and story. Through my position, I was fortunate to get to know a lot of the children and their families than I did before. I cannot put into words how much ugaMiracle means to me. Knowing that I can have a small part in raising money to help children at Children’s Healthcare of Atlanta and being able to love on our Miracle Families makes my heart whole. What has your experience been like so far as Alpha Chi's panhellenic delegate? As Alpha Chi’s panhellenic delegate, I act as the liaison between Alpha Chi and the Panhellenic Council. I attend weekly meetings in which I hear all of the upcoming events and information in the Panhellenic world. At the beginning of my term, UGA opened up our campus to extension and staking and ultimately adding two new sororities to our campus within the next few years. Because they were originally on our campus and had to leave, Delta Phi Epsilon was the first sorority to be offered to come back to our campus in the Fall of 2015. With the staking process, interested sororities had to submit an application first, and once the Panhellenic Council narrowed it down to two choices, the sororities had to give a presentation. Alpha Phi and Alpha Xi Delta were the two sororities to give presentations to our Panhellenic sororities. At the end of the presentations, each UGA sorority was allowed one chapter vote on which sorority they wanted to be offered to colonize on UGA’s campus in Fall of 2017. After Alpha Chi made a chapter vote and we talked as an Executive Board, I was responsible for bringing our vote to the Panhellenic Council. In the end, Alpha Phi was extended an invitation to come to UGA in 2017. Overall, extension and staking was a very eye-opening process that I enjoyed. Now, Panhellenic continues as normal, with weekly meetings and updates about Greek Life. I love being able to represent Alpha Chi Omega as the Panhellenic Delegate. What have you learned most about yourself in Alpha Chi Omega? Alpha Chi Omega taught me that being myself is the best person I can be. I have learned to have confidence in who I am and let my strengths thrive. My sisters are my biggest fans and supporters through everything in my life and inspire me everyday.